Athletes are two to three times more likely than the average person to develop an eating disorder. Those impacted by disordered eating or nutritional deficiencies will become be less competitive in sport, more prone to injury and risk permanent physical damage that, in some cases, can be life threatening. Walden’s GOALS Intensive Outpatient Program is built specifically for adult athletes (18+) who need guidance on how best to optimize the balance between nutritional needs and performance goals. To equip athletes with the mental and nutritional skills to achieve their full athletic potential and sustain a positive mindset. Our multidisciplinary team of experts includes counselors, sport psychologists, dietitians, and exercise science professionals. 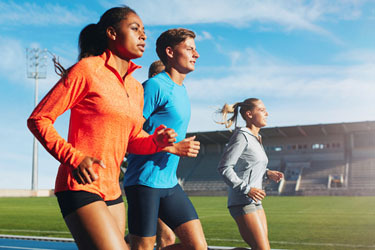 As experienced athletes and licensed professionals, they understand the unique challenges, requirements and high demands of competitive sports. Meet the team. Each athlete receives an individualized assessment, counseling, group education and exposure to essential life skills that allow them to thrive both inside and outside of their sport. In some cases, treatment can be conducted without interruption of training or sport participation. When athletes can benefit from time off, our team works to fully preserve the athlete identity and ensure the strongest possible return to competition. Our certified exercise specialist ensures this smooth transition. Does not require a higher level of care. Individuals attend three nights per week, three hours each night, at Walden’s Waltham clinic. Most insurances accepted. Physician referral not required. How Should Gyms Handle Exercise Addicts?